Can Xi Jinping Bring Change to China's Military? Will an order requiring senior officers to spend time on front lines as enlisted soldiers change the military? Over the weekend Chinese President Xi Jinping issued an order requiring PLA and People’s Armed Police generals and senior officers to spend two weeks on front lines as enlisted, low-ranking soliders. The move is part of an ongoing effort by Xi to impose greater discipline on a military brass that many argue was allowed to grow intolerably corrupt under Xi’s two immediate predecessors. The fear is that the extravagance the military leadership indulges in is reducing the army’s professionalism and alienating officers from the men they command, ultimately curtailing combat-readiness. Since taking office in November, Xi has taken a number of steps that aim to change this military culture, or at least tame its greatest excesses. Some of these measures have been rather small and symbolic, as when military officers attending the National People’s Congress last month were required to share hotel rooms. Other aspects have been more substantive such as banning expensive banquets and alcohol consumption, as well as prohibiting military officers from obtaining military license plates for their private vehicles. The new directive imposes similar conditions on the military: “They need to provide for themselves and pay for their own food. They must not accept any banquet invitation, join any sight-seeing tours, accept gifts or interfere with local affairs." Unlike the restrictions cited above, however, the demotions here will only be temporary, assuming it is enforced on so many officers at all. But the order is more notable for its symbolism, given the parallels it has with Mao’s rule of China when senior Party and military leaders were often forced to perform humiliating feats ostensibly to retain their revolutionary fervor, but really to reinforce Mao’s ironclad rule. As SCMP points out, the military was not exempt from this in all occasions, and was the primary target in at least one campaign in 1958. The senior CCP leadership’s relationship with the military brass has changed in fundamental ways since Mao and Deng Xiaoping’s time in power. Unlike Mao and Deng Xiaoping, who had both been battle-hardened guerrilla commanders before coming to power, Jiang Zemin and Hu Jintao hadn’t served in the military and were thus less certain of its leader’s personal loyalty. According to Richard McGregor, Jiang took this message seriously by visiting 100 military installations in his first two years in power, and preparing for all military parades by practicing his moves in front of a mirror the night before. Hu Jintao himself wasn’t above taking symbolic actions of his own when first coming to power. Unlike Jiang and Hu, though, Xi Jinping is a princeling whose father was a commander in the Red Army during the wars that brought the Communist Party to power. 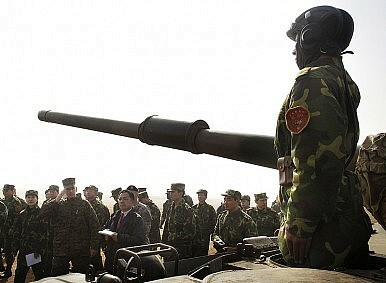 This gives Xi a certain amount of respect with the military brass, many of whom he has known for years. Notably, Xi also differs from his two immediate predecessors in that he inherited the chairmanship of the Central Military Commission, the country’s top military decision-making body, at the same time that he became head of the Party in November. All of these factors better position Xi to bring change to the military than were Hu and Jiang. Still, the order Xi issued over the weekend is unlikely to have much impact, the Rand Corporation’s Harold predicts. “I don’t see much reason to think that 15 days out of 365 spent cleaning latrines or eating grunt rations will systematically reshape the thinking of military leaders whose perquisites are almost certainly beyond the imaginings of most enlistees,” Harold says. Last year’s annual report on Chinese military developments was widely criticized. What does the 2013 version offer? The Relationship Between the Size of China’s Economy and Its Military PostureCould China Flash Invade Taiwan?China's Military May Almost Have 3000 Aircraft, But What About Everyone Else?Take Notice, Asia: China's Military Is Getting Leaner and More LethalWondering Why China Held Its Parade? Here Are 5 Things Beijing Accomplished.